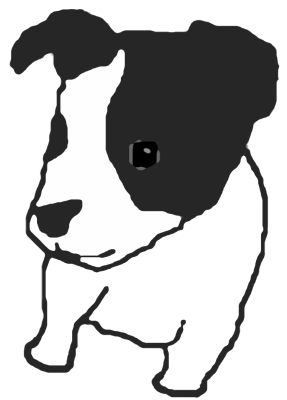 Puppy Linux Discussion Forum :: View topic - New Puppy Logo! Posted: Thu 05 Jul 2007, 19:16 Post subject: New Puppy Logo! In conjunction with requests to update Puppy's web presence, one of the issues to be addressed was a new logo - with Barry's consent, of course. I took the initiative and asked a graphic artist named Tim Dunn to design us a logo (for free). Here is Tim's response. I have the others the same but in a choice of colors. Personally I think it's awesome. What do you guys think? I will shortly post some possible Puppy wallpapers featuring the new logo, including some mirrored text. Enjoy! WOW This new Logo looks great, I take it this is a she dog yes? so we`ve got to give her a name! OK PizzaPup, come up with one of your good ones. Yes, it definitely looks like a she! This logo has the advantage of looking very professional. What are the two dots for at the bottom? The two dots are "glitches" I have now removed. I only noticed them after I posted the image to tinypic.com so I have uploaded a fixed version. Maybe I accidentally put them there when I was viewing the original in GIMP. The line on her neck doesnt quite reach the circular edge. Nice. The face can benefit from some more depth/3d effect. OH WOW! WhoDo? This person did a fantabulous job! Very professional indeed! That's a logo that'll look excellent centred ontop of many different types of wallpapers, or shrunk down and placed to the lower-right, etc. I can't wait to see what comes out of this! Woohoo! As for name I thought "Fifi" but then realised, "That's more of a poodle's name!" The more I look at the picture though, despite being somewhat colourblind, I'd say she has a sort of "ginger-colour", right? Okie, y'all can laugh now! Proud user of LXpup and 3-Headed Dog. world may be traced back to a single female source from northeast Africa. They were secularists but thought it funny to nickname "her" Eve. Does this one look better?
" Why not "Eve"? " so why not use the name Eve as recognition for this previous software gem. But how about - "Trix" ..
Maybe we should have a competition for a name - the winner getting a 'free' copy of "Unleashed CD" for the version that finally gets this logo..- just a suggestion..
Also I'd suggest that the 'name' be placed onto a 2nd (similar shape, color, etc..) tag next to the one with Puppy on it ..
Keep up the good ideas WhoDo.. It's too hard to choose, they are all good!